Raising capital for startups: how long does funding actually take? One of the most important jobs of a CEO is to make sure the company doesn’t run out of money. A CEO has to manage their available cash on hand strategically until the next VC funding round, keeping the monthly burn rate in line while hitting key milestones. Given the importance of this metric, one would think that industry statistics are routinely published about it for entrepreneurs and investors. Unfortunately, this is not the case. 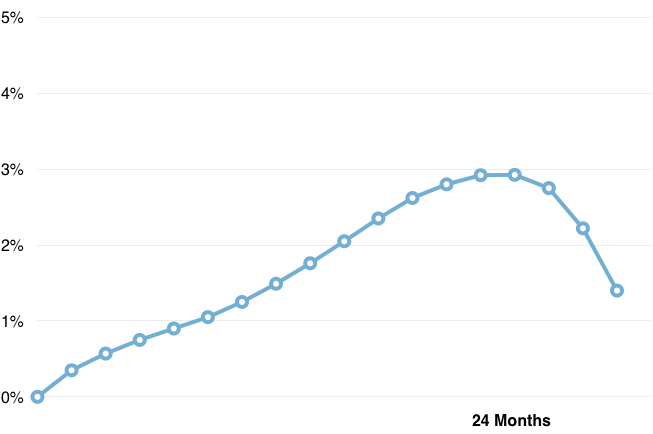 Data about the time between VC funding rounds is hard to come by. In this Carta blog post, we will show data on how long it actually takes to get funded. Objective: Present industry-level data on time between VC funding rounds. At a minimum, entrepreneurs should know the median time to the next funding round, and understand how this key metric varies for different rounds. The first two startups in your list have series Seed and Series A funding dates, but the third startup has only a Series Seed date. This particular startup (Machine Learning for Children, Inc.) raised Seed funding ten months ago but has not raised its Series A yet. Knowing this, what is the median time between funding rounds of these startups? The question, of course, is what to do with the third startup. The naive approach is to simply dismiss this data point and only use the first two observations. But this would be incorrect, as that strategy would answer a very different question, which is: “What is the average time between funding rounds of the subgroup of startups raised funding within the first 16 months?”. Dismissing data points that are still “open” underestimates the time to the next round. So, how could you get an unbiased estimate? This is a solved problem in other disciplines. The problem presented by the third startup above is known as “right-hand censoring”. Key in epidemiology, this problem arises when a research study is not able to follow a cohort of patients (or customers, companies, etc.) long enough to observe the time of the event of interest for all subjects. In our example, right-hand censoring prevents us from seeing today that Machine Learning for Children, Inc. will be able to raise its series A in 18 months (if we were able to see into the future). Survival analysis is the methodology that has been developed to address the right-hand censoring problem. The idea is to create a cohort with a certain “original state” at the start of the study. In our example, the start date is given by the Series Seed funding date of these companies. We would then analyze the number of companies reaching a Series A round after 6, 7, 8, or more months. 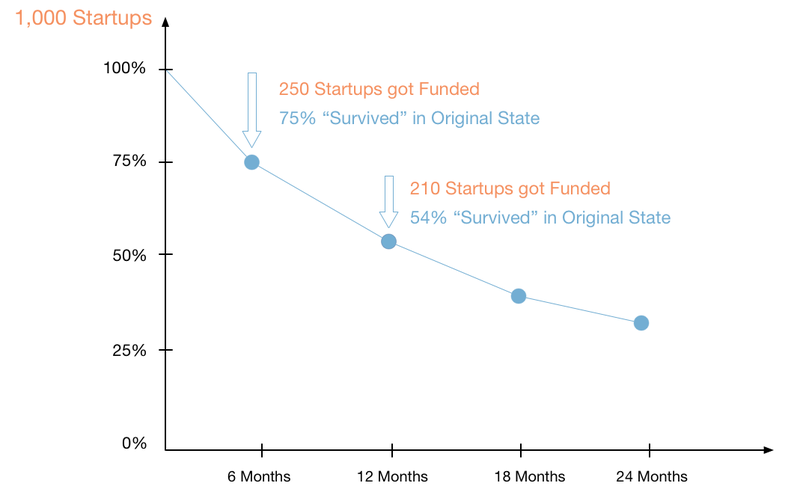 Each of these data points would then allow us to estimate the percentage of companies still “surviving” in their original state with only Series Seed funding. The following graph depicts this strategy. So, how long does it take to get funded? Without controlling for right-hand censoring, the naive approach provides estimates that range from 14 to 19 months between funding rounds. Only once we include all data points do we get estimates closer to the two-year timeframe. The data also indicates that CEOs need to plan for a longer runway with later funding rounds, as the time span between rounds increases. The differences between series Seed-to-A, A-to-B, and B-to-C are statistically significant at 5%. The next graph shows the probability of getting funded over time. As can be observed, this probability reaches a global maximum at 24 months (i.e., across all types of funding rounds). This means that a CEO should plan to raise at least two years worth of runway in order to maximize the probability of getting funded (while hitting those key milestones, of course). If that were not the case, we would strongly recommend adjusting the monthly burn rate downwards. In a future blog post, we will utilize Carta’s data to analyze how the time between funding rounds varies by sector and geographic region.